We as developers and designers have stumbled upon the term - UX aka User eXperience, quite a few times in the past few years. So what really is UX? Is it something that adds real value or is it just another buzzword? This article is an attempt to analyze and assess the usefulness, relevance and importance of UX in an application development process. 1) People who use iPhone are generally ardent fans of iOS and all other Apple products. They simply love the user interface that is so intuitive and “easy” to use. Apple/Mac/iOS followers are almost like a cult. 2) Google invested significantly on “Material Design” because they believed that the Android interface is their brand. 3) Not too long ago, Microsoft revamped their most successful product MS Office to make it more user-friendly and that is how the Ribbon interface was born. These are some telling examples of the importance of UX in today’s digital world. UX plays a critical role in the success of games. So, is UX that important? Let us find out. Let’s start with a layman’s definition of UX. It is a term used as an abbreviation for User eXperience. User experience is nothing but the experience that a user would get when he/she uses or interacts with an application or a system. UI is the ‘decoration’ of an application or a product whereas UX is how the user feels (and hence the word experience) while using that application or product. Therefore, a great looking Ferrari car would be the UI and the feeling of driving something awesome is the UX! A more complex definition of UX would be – a methodology followed while developing a user interface that would make the system (or application) more user friendly. This also ensures that the system (or application) gets a wider acceptance and there is minimal or less learning curve for using the system, from an end-user’s perspective. UX has been discussed since a long time. Based on Google Trends, it is evident that there has been a continued interest in general about user experience since 2004, till date. When we develop any application, we, as developers and architects, start with the technology architecture. We think about various functional and non-functional aspects of an application (or system) that we want to build and then we go about deciding the right technologies for the same. The methodology followed for designing a user experience for an application is somewhat similar. It is generally based on the “Five Planes” concept explained in the book ‘The Elements of User Experience: User-Centered Design for the Web‘, by Jesse James Garrett. The process above is self-explanatory. It bodes well with the agile development process in terms of multiple iterations of UX that are carried out during the agile development process. 1) UX would make the product more user-friendly because of the ease of use. This is typically critical for products or apps that are designed for end-users (B2C apps). Web apps particularly fall in this category and hence it is critical that UX is a key aspect of the web app development process. 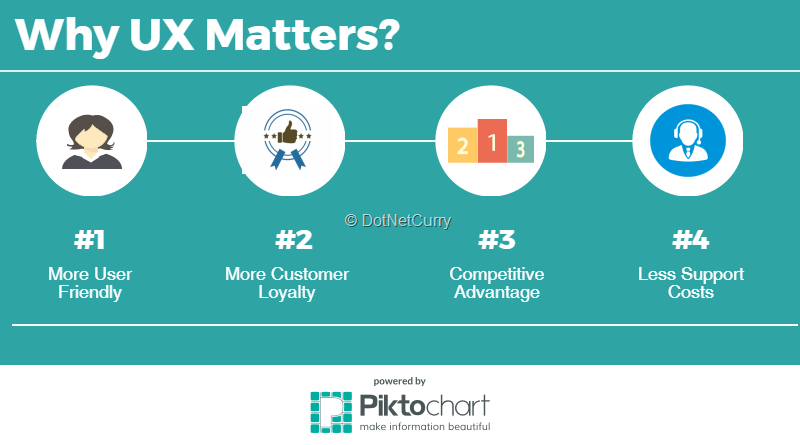 2) UX also has a role to play in customer loyalty due to the stickiness of a product or brand that usually UX creates. This makes a whole lot of sense in “try and buy” kind of applications like ecommerce. If your UX is good, it will instantly create user stickiness for your site. You typically like one application over another because you find it very convenient while interacting with application. So for instance, you find Amazon.com better over some other ecommerce web site because you can easily find your products. Or you would find Uber better over some other cab aggregation service app, because for you, Uber is intuitive to use. 3) UX can also indirectly result into building a competitive advantage. The “experience” that users have may encourage (or force) users to continue using your app or product, over other products. 4) A good UX would result in reduced support costs as well. If users are able to find what they want in the product, then they may not be reaching out to support personnel. Hence, you would save on your support cost to certain extent if you invest in building a good UX. Now that we have understood the usefulness of UX in general, we will dive deep further by understanding the relevance of UX from various perspectives. Well, a good clean well-designed app clearly means that the users are going to find it very easy to use it. However, while designing the UX, you should also consider the user-base. For a typical B2C kind of application, the user base could be from kids to senior citizens and UX needs to cater to all such scenarios. Typically, in the UX process, a lot of attention is given to the user profile. Factors that are considered are types of user, age, targeted market (local/international) and so on. For developers or programmers (and especially for web developers), it is important to wear the hat of the consumer (or the end-user of app) for a while to understand if the application you are building is user-friendly or not. Nowadays, end users or simply users of app/product expect the user experience to be good, else they simply move away to a similar app/product, or they continue ranting about a bad UI. In summary, UX is certainly a must-have aspect from an end-user perspective. 1) When the user clicked on the Checkout button, they were redirected to a registration page that had only a few fields to be filled in. 2) However, the users were not too keen on going through registration process. In addition, that was resulting into them not completing the purchase. This was a revenue loss! 3) This was found out during a UX study and the solution was to replace “Register” with “Continue” button that would make it voluntary for users to register. This ensured that users could proceed to checkout and that resulted in 45% increase in sales. This is famously called $300 Million button fix. You can read more about it here. Everything is an app now and we live in a world where we are using one app or the other – be it your smartphone, be it on-line shopping or your favorite IDE like VS Code. Each app has different UX needs. Your phone-calling app needs to have a simple and functional UX. A car-racing game that you play needs to have a very catchy and vibrant design. A trading platform that a broker uses needs to have a UX which is complex enough to cover all aspects of trading, but at the same time simple enough to have all the information at his/her fingertips. If you are developing a web application that would be accessed by users on mobile and on web browser, then the UX needs to be responsive and usable on both form factors. Any app that you choose to develop or work on, you need to make sure that the UX is fitting to the need of app. If it is a consumer app, then the UX needs to be catchy. If it is a business application, a catchy UI with lots of colors may look overdone. Hence, the UX needs to focus more on functional aspects in this case. We, as developers, need to be cognizant of this aspect while developing apps. Irrespective of the Software Development Life Cycle (SDLC) process you follow, UX will be a critical and important part of the development process. This is typically valid for products that are built afresh. Things like responsive design, breadcrumbs in UI, smooth transitions, theming etc. are now a given, in any app development process. This means that the software development process needs to factor in the effort required for building user interface and teams should have people with right skill-sets in order to handle such requirements. It is quite imperative that you as a programmer/developer should know about this basic UX aspect. Right from product manager to scrum master to a developer or tester – everyone – needs to have good understanding of UX of the app or product they are building. 1) First, they have clearly identified two different “consumers” of their service – the restaurants and the diners. 2) Then they built teams that are a cohesive unit of both designers and engineers (or programmers). Interestingly, both the teams are closely involved in design and development process together. 3) There is a significant focus on collaboration between various team members playing different roles. You can get more details about this case study here. UX comes with a front-loaded cost. Experienced UX designers and the effort required to build UX for a product or app involves significant costs. However, the ROI on UX is realized when because of your good UX, your app is being used by many people or your app is serving the purpose for which it was build. While the exact ROI is difficult to calculate, it is said that the cost to benefit ratio for usability is $1 : $10 to $100. You can visit this infographic for more details on similar metrics. It is quite evident that UX is certainly not a hype anymore. But it is also important to keep in mind that any tool that is used without the right context or is overused for the sake of using it, would not result into the desired outcome. The case with UX is somewhat similar. You need to understand all aspects of an application “experience” and then design UX accordingly. You also need to make room for UX in your cost calculations, your execution process and well, in your own thinking process too. UX is not User eXperience anymore. It is User experience eXpected!